Home / Daily Update • LGBTQ / University of Bristol Did It! 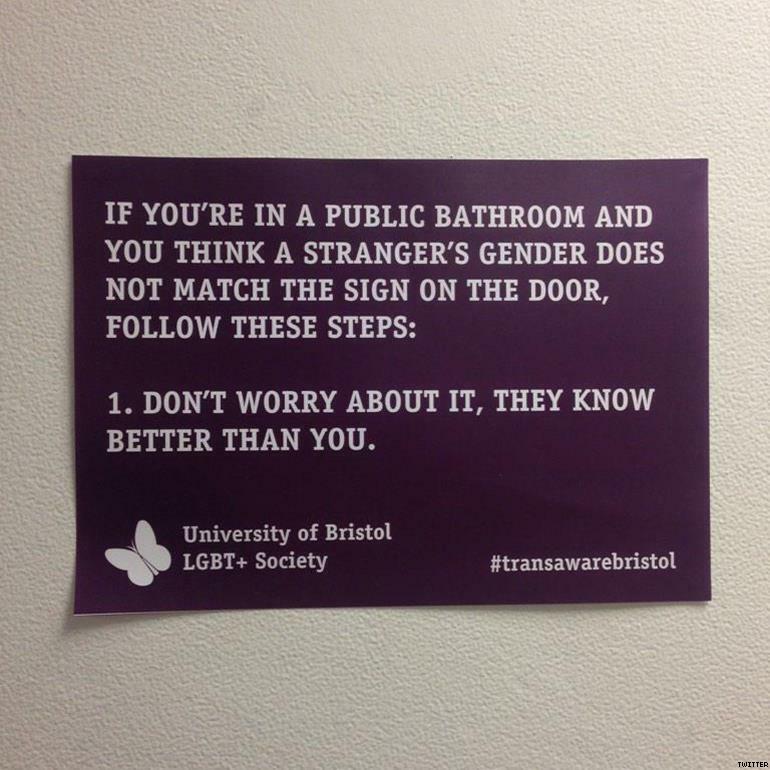 University of Bristol Did It! Last night, George sent me a link, and it made my day. It seems like somehow, the world is starting to grow up. It’s about damned time. Too many people today are forced to deal with “bathroom shame” for many reasons. Being Trans (-gendered -sexual) can cause a lot of confusion for a lot of people. Sometimes, you may feel prompted to ask an apparent male why they are using the ladies’ room, or why that cute girl is headed into the men’s. Just don’t do it. Outside of that situation, the best thing you can do, if you are unsure of an individual’s gender role, is to ask them polite unbiased questions such as, “Which pronouns do you prefer?” This opens the dialogue which is difficult for both parties at times. Other than that, the best thing you can do is keep your mouth shut. Most definitely do NOT tell anyone that they are using the “wrong” restroom. If you know someone, and notice them entering the restroom they would normally not use, it’s entirely appropriate to point out the discrepancy. If you don’t know the other person, tread carefully and respectfully. Either way, it can be embarrassing for both parties, so just don’t do that to people you are not well acquainted with.